I usually have balls of cookie dough sitting in the freezer. The frozen mounds of dough have endless potential. They might become an easy dessert option for hosted dinners. Or they might celebrate something or someone–what better way than with a cookie? Or, perhaps most often, they serve as a quick cookie treat when the mood strikes. But lately, I’ve fallen out of the habit of stashing away cookie dough. My stock is currently depleted, so I started thinking about a new go-to dessert. One that’s quick, easy to make and doesn’t rely on me having the forethought to freeze dough. Enter my solution: the skillet cookie. 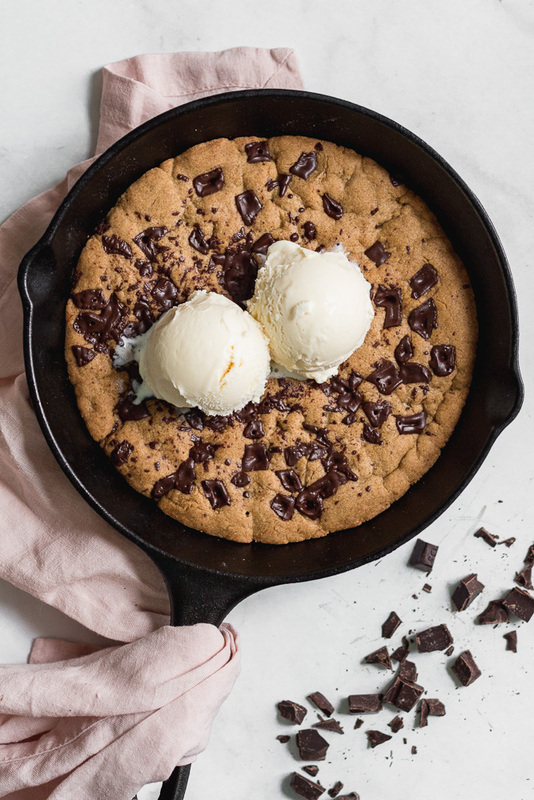 This skillet cookie recipe is almost like a cookie-blondie combo. The middle of the cookie stays soft & gooey, and the edges get a little chewy & slightly crisp. Perfection if you ask me. And when that craving hits or company comes over, it’s quick, easy, & delicious. 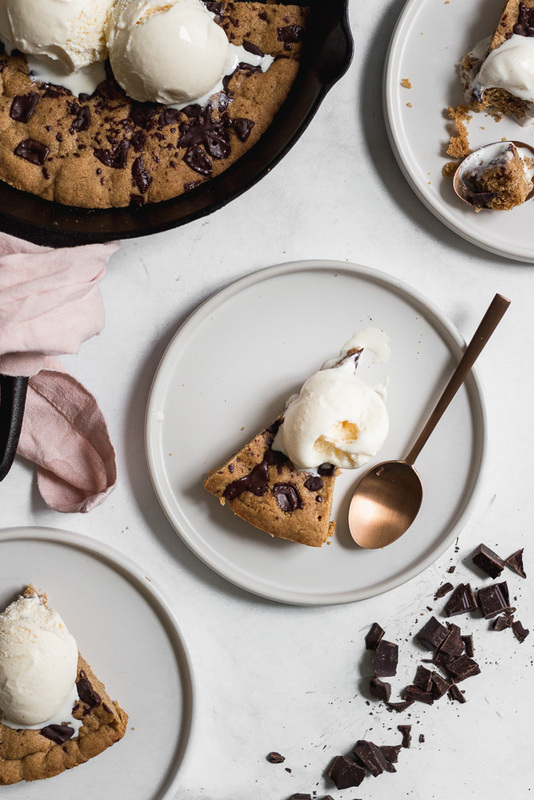 In fact, this skillet cookie is so good, that it’ll be our Christmas sweet this year. Sam & I had planned to be away on holiday for Christmas, but as luck would have it, I caught a bug the day we were supposed to leave & now we’ll be home for the holidays after-all. We’re trying to piece together an unplanned Christmas meal from an empty fridge & all the bits & bobs in our pantry and freezer. The only thing I don’t have to worry about is dessert, because I always have the ingredients for cookies on hand. I desperately need simplicity for this unprepared Christmas feast. And in my opinion, there is no better simple dessert than one giant warm, chewy cookie that takes just a few minutes to throw together. 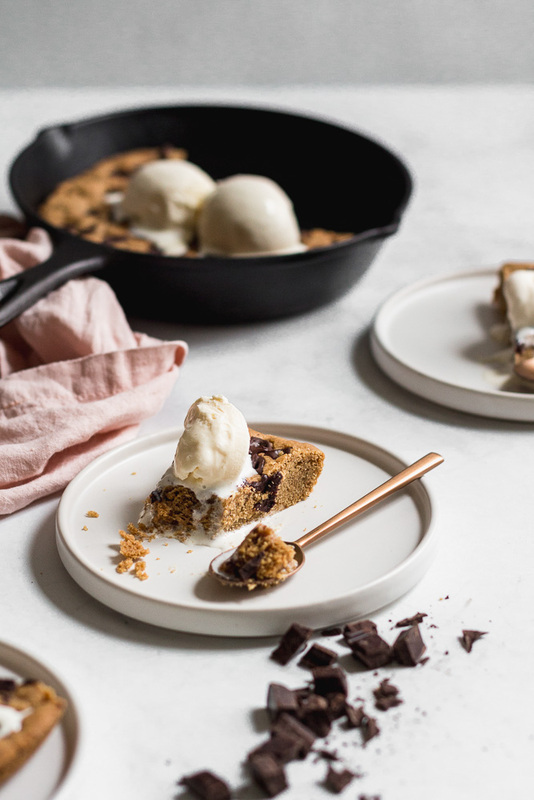 This Biscoff skillet cookie is a perfect treat when you really just need a cookie or even for a special occasion. I’ve spiced this recipe up with cinnamon, dark chocolate, & loads of Biscoff. Making the skillet cookie is a snap. First, combine all the dry ingredients. Then, mix melted butter with rich brown sugar, eggs, and vanilla. Once you’ve mixed in the dry ingredients, stir in chunks of dark chocolate, spread it all in a cast iron skillet, and swirl Biscoff through the cookie dough before sprinkling the dough with more chocolate. 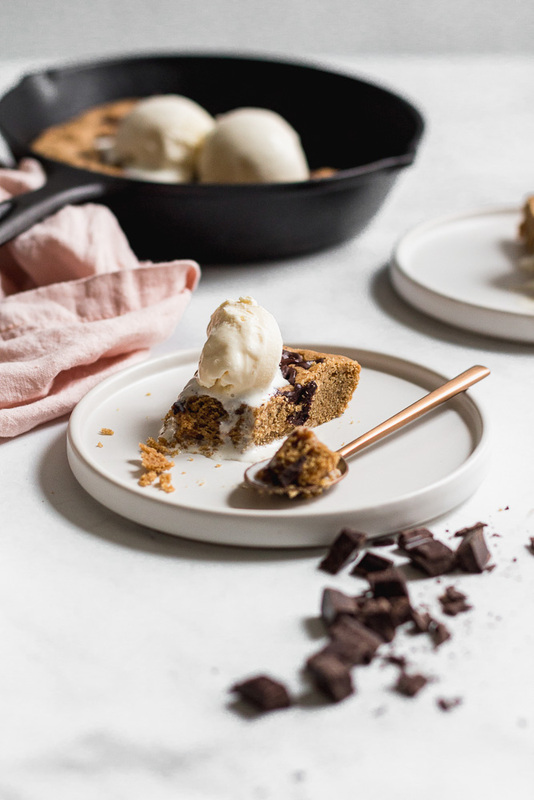 If you let the skillet cookie cool completely, you can slice it to serve. But I prefer it still warm and scooped straight from the pan with a spoon & a little ice cream. 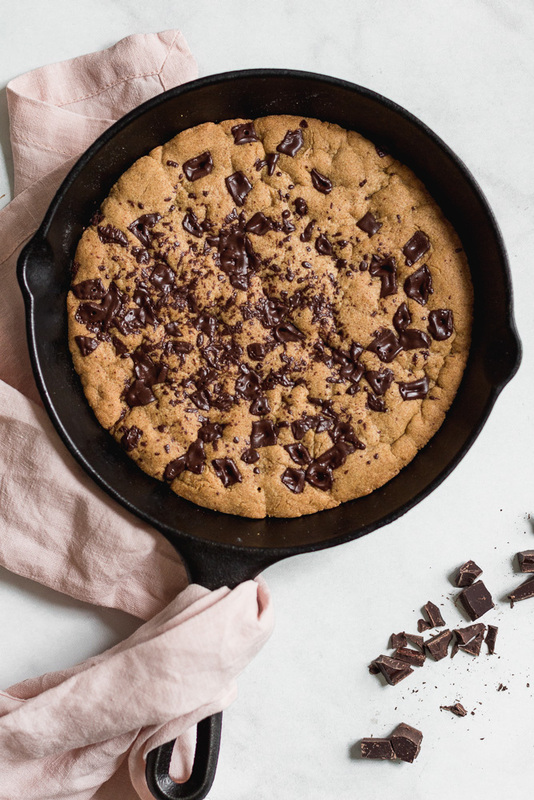 This Biscoff & dark chocolate skillet cookie is gooey in the middle, chewy and slightly crisp on the edges, & the perfect quick dessert. Serve it warm straight from the pan or let it cool and slice it. Either way, it's the perfect combo of cinnamon-y, caramel cookie butter & rich dark chocolate. Preheat the oven to 350 degrees Fahrenheit. Butter a 10" cast iron skillet. In a large mixing bowl, using an electric hand mixer on low, mix the butter and brown sugar together until combined. Add in the egg and vanilla and mix on low until combined. Sitr in 1/2 cup of the chocolate chunks. Scoop the dough into the greased skillet and spread evenly with an offset spatula. In a non-stick skillet, heat the Biscoff spread over low head until it's slightly loosened and more pourable. Drizzle the Biscoff over the cookie dough and swirl it through the dough using the offset spatula. Sprinkle the remaining 2 tablespoons of chocolate chunks over the top of the dough and lightly press them down, just a bit. Bake for 20-25 minutes until the edges are set and the middle is still soft. Allow to cool at least 10 minutes before serving. Serve warm or at room temperature.